I’m not always a big fan of cocktails. I love the idea, and the fun of watching a bartender put something together for me, but so often the end result just makes me wish I’d ordered a glass of gin on the rocks. Too sweet, too bitter, or just plain weird – what’s the point? I generally stick to one of a few old-style drinks (whiskey sour, sidecar, gin martini, etc) unless I feel like the bartender really knows his or her business. 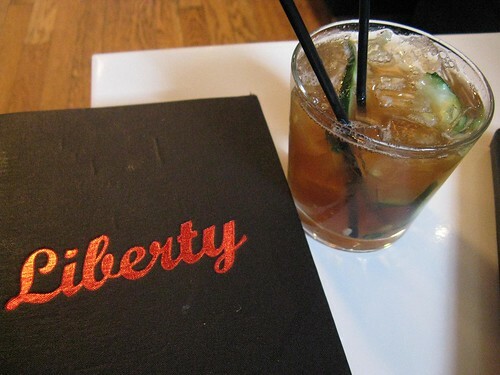 Last week we stopped into a bar on Capitol Hill called Liberty. We were on our way to Poppy for dinner (more on that later) and wanted to spend some quality time with a good drink first. 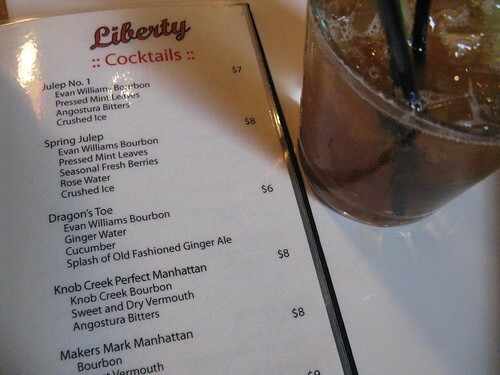 Liberty has one of the longest cocktail lists I have ever seen, and it’s real stuff – not just sugary vodka in martini glasses, one of my major peeves. It looked promising, so we boldly ordered off the menu. Being the gin hussy that I am, I ordered the Aviation Old-fashioned (gin, two kinds of bitters, a big honking strip of orange zest), and Jon ordered something called a Dragon’s Toe. I liked my drink; in fact, it grew on me as I drank it to the point that I really missed it once it was gone. But the Dragon’s Toe was love at first sip. See the ingredients on the menu in the picture? Bourbon, ginger water, ginger ale, and cucumber. Sounds weird, tastes magnificent. The spicy sweetness of the bourbon is magnified by the spicy ginger and sweet ginger ale, and the cucumber cools it all down without clashing. Who woulda thunk?